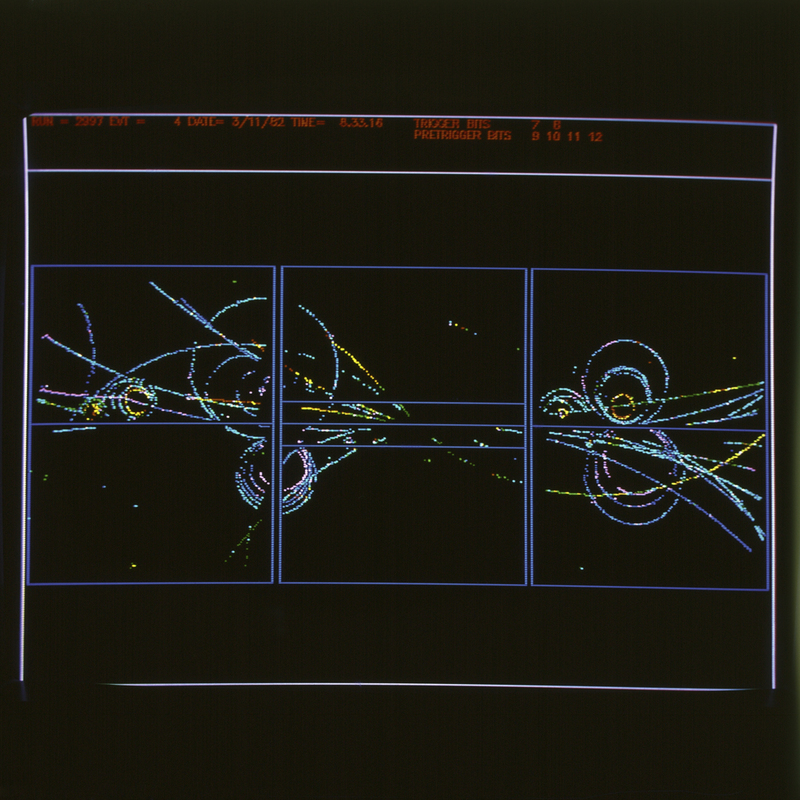 A proton anti-proton collision at CERN, from 1982. (Image by CERN). Good news for anyone who didn't have plans for this Friday night: the Large Hadron Collider might be starting up, possibly at 00:00 on Saturday, Geneva time. And you can monitor everything from the magnet temperatures to detector performance, thanks to this handy CERN portal put together by a reader of the online tech newspaper the Register to make the dense, yet disconnected jungle of CERN webpages easier for the average LHC fanboy or fangirl to navigate. As for me, well all the excitement over the world's most advanced machine makes me long for simpler times, when physicists turned to photographic plates, not giant particle detectors, to learn about the unseen world. It's somewhat surprising, but humans have been photographing the innards of the nucleus and elementary particles for nearly as long as they've been photographing themselves in corsets, silly hats, and handlebar mustaches. Our story begins in France,where the curse of obscurity seems to have plagued the Niepce family mercilessly. Joseph Nicephore Niepce produced the first-ever photograph in the summer of 1826, but his pioneering work has been largely ignored while Louise Daguerre, who announced his invention of photography ten years later, has been immortalized in the word "daguerrotype." Then, in 18671, the son of Niepce's first cousin, Abel Niepce de St. Victor, noticed that one of his photographic plates mysteriously darkened when stored near uranium salts, even though the plate had been wrapped in black paper. Niepce de St. Victor guessed that the uranium have somehow been shining. This guess relegated yet another Niepce to crushing obscurity; nearly thirty years later, Henri Bequerel, the physicist, discovered radioactivity pretty much the same way. These days, we capture images using CCDs, but old-fashioned photography was all about chemistry. A photographer would coat a plate of glass about two millimeters thick with a layer of emulsion. (An emulsion is really just a suspension, in this case tiny grains of silver bromide or silver iodide suspended in gelatin goop.) When the plate is exposed to light, minuscule specks of silver, just a few atoms in size, form in the grains. To retrieve the image, the photographer would bathe the plate in a developer that caused grains with silver specks to go completely silver. Then he or she would dissolve the unaffected grains with a second solution known as a fixer. Darker areas in the image formed where grains were exposed to more light. To catch a particle2, early 20th century physicists used basically the same techniques, except the emulsion contained about 10 times more silver bromide or silver iodide grains. As an alpha particle, (two protons and two neutrons) flies through the plate, it passes through some of the grains, causing specks of silver to form that blacken the entire grain when developed and fixed. If the concentration of grains is low, the particle's trajectory will come out as a dotted line, while more grains achieve a striking solid line, such as in the following image. This explosive image was created by hundreds of alpha particles flying out from a speck of radium placed on the photographic plate. Occhialini and Powell, 1947. Printed in , p. 26. "The alpha particles emerged from a speck of a radium salt which was allowed to fall on the surface of the plate. The more heavily ionising alpha particles give continuous tracks." Particle collisions, caught the old-fashioned way, have a certain grittiness to them that's a far cry from the rainbow-toned computer graphics we're used to seeing from modern-day experiments. The following image shows what happened when a cosmic ray—a heavy nucleus in this case—barreled through a stack of emulsions. sardinian Expedition, 1953. Printed in , p. 65. "Successive fragmentation of a heavy nucleus of the primary cosmic radiation." In the first column, a third of the way down, you can barely make out a small splotch as the nucleus glanced off another particle, losing an alpha particle. In the second column, about halfway down, there's a slightly more dramatic splatter where the nucleus lost several charged protons and even a few mesons. In the third column, things really got ugly for our somewhat reduced cosmic ray; it collided again, this time losing all its nucleons, producing that quintessential high-energy physics image, the particle spray. 1. Powell, C.F., P.H. Fowler, and D.H. Perkins. 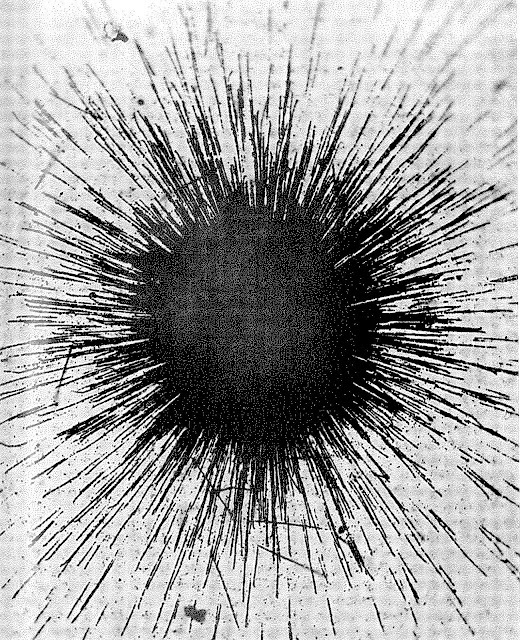 The Study of Elementary Particles by the Photographic Method: An account of The Principle Techniques and Discoveries illustrated by An Atlas of Photomicrographs. London: Pergamon, 1959. 2. Powell, C.F. and G.P.S. Occhialini. 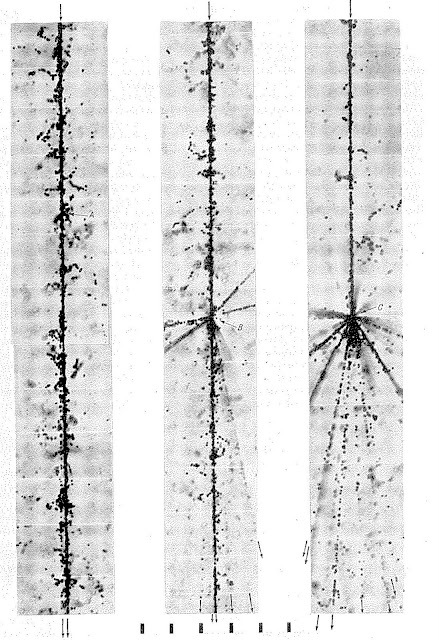 Nuclear Physics in Photgraphs: Tracks of Charged Particles in Photographic Emulsions. Oxford: Clarendon Press, 1947. Print. Special thanks to the Neils Bohr Library and Archives at the American Institute of Physics, where I found these delightful tomes.